Investigators comb the scene where Hines’ body was found. In bottom photo, observers take a peek down the sink hole in which Hines’ body was discovered, and subsequently recovered from. 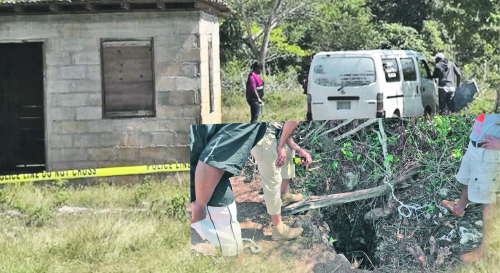 With mystery still shrouding the gruesome slaying of noted Trelawny attorney, 65-year-old William Hines, affectionately called ‘Baldy’, whose decomposing body was retrieved from a 40-foot-deep sink hole on his farm at Orange Valley district on the border of Trelawny and St. James on Sunday, colleagues have responded with shock and anger at the authorities, arguing that enough resources were not committed to search for him since he went missing on January 6. Hines’ body, with hands and feet bound, was discovered after a community member stumbled upon a number of objects and blood stains, which pointed to the hole in which his body was dumped. A search party comprising the police, firefighters, family members and colleagues returned to the site on Sunday after attempts to retrieve the body on Saturday were hampered by a lack of equipment. Khadine Colman, one attorney-at-law who was among those at the scene, while expressing profound sadness at the brutal way in which Hines met his end, lambasted the authorities, citing that not enough money and resources were committed to the search, which took a month to locate Hines. “We are deeply saddened and extremely upset about the loss of our colleague and we are disturbed by the length of time it took to find him and for us to even get to this point. We know that his soul cannot rest in peace until his killer or killers are found,” the attorney said. She pointed to a lack of resources granted to the police and the fire service, citing that this was caused by misplaced priorities by the government, as the search and retrieval of Hines’ body had to be curtailed on Saturday when an ambulance at the scene and other equipment had to be diverted to an accident scene along the Rose Hall main road. Hines was described by his colleagues, as a strident advocate for rehabilitation of wrongdoers, and one of his colleagues bemoaned the fact that while he practiced criminal law, it may have been persons whom he would have represented in the court who ended his life. 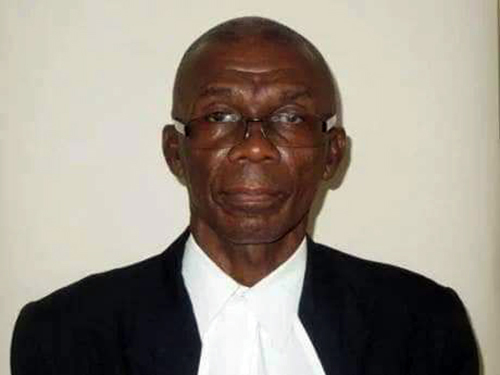 The noted attorney, who practiced law in Kingston for a number of years, was originally from Comfort Hall in Trelawny and an avid lover of farming, and had returned to Trelawny and bought a piece of land in a neighbouring community to raise cattle. One of Hines’ sisters remembers him fondly as a loving, kind and supportive person. “The last time we spoke was during the holidays when we shared good tidings for the New Year. But it did not materialize for him as his life ended abruptly. He was very much into farming and would come down from Kingston every weekend to look after his livestock. This is very difficult for us as a family. It is hard, very hard to take,” she said.